This name uses Eastern Slavic naming customs; the patronymic is Ivanovich and the family name is Strelkov. Igor Ivanovich Strelkov, born Igor Vsevolodovich Girkin (Russian: И́горь Ива́нович Стрелко́в, IPA: [ˈiɡərʲ ɪˈvanəvʲɪtɕ strʲɪlˈkof], Russian: И́горь Все́володович Ги́ркин, IPA: [ˈiɡərʲ ˈfsʲɛvələdəvʲɪtɕ ˈɡʲirkʲɪn]), born on 17 December 1970 is a Russian army artillery veteran who played a key role in the Annexation of Crimea by the Russian Federation, and later the War in Donbass as an organizer of the Donetsk People's Republic's militant groups. Strelkov, a self-described Russian nationalist, was charged by Ukrainian authorities with terrorism. He is currently sanctioned by the European Union for his leading role in the armed conflict in eastern Ukraine. Ukrainian authorities have called him a retired colonel of the GRU (Russia's external military intelligence organisation). According to different sources, he unreservedly demands that the "liberal clans" (liberal elements of the Russian elite) be destroyed. On 28 May 2016 he formed the Russian National Movement, a political group in favor of "uniting the Russian Federation, Ukraine, Belarus, and other Russian lands into a single all-Russian state and transforming the entire territory of the former USSR into an unconditional zone of Russian influence." The Russian media has identified Strelkov as an officer of the Russian military reserves who has expressed hardline views on eliminating perceived enemies of the Russian state and has fought on the federal side in Russian counter-separatist campaigns in Chechnya and on the pro-Moscow separatist side in the conflict in Moldova's breakaway region of Transnistria. According to various sources, Strelkov took part in the Bosnian War as a volunteer on the Serb side, and in Chechnya under contract. [note 1] In 1999, he published his memoirs of the fighting in Bosnia and Herzegovina. In 2014, he was accused by Bosnian media (Klix) and a retired Bosnian Army officer of having been involved in the Višegrad massacres in which thousands of civilians were killed in 1992. The BBC reported Strelkov may have worked for Russia's Federal Security Service (FSB) in a counter-terrorism unit, citing Russian military experts. According to Russian media, he has served as an FSB officer and his last role before retirement was reportedly with the FSB's Directorate for Combating International Terrorism. In 2014 Anonymous International disclosed what it said were Strelkov's personal emails, revealing that he had served in the FSB for 18 years from 1996 to March 2013, including in Chechnya from 1999 to 2005, The Moscow Times reported. The newspaper also said Girkin was born in Moscow and that it contacted him by email and phone but that he would not confirm the claims. A local pro-Russia militia leader in Ukraine, Vyacheslav Ponomarev, a self-described old friend of Girkin's, said the information about Girkin was true. His pseudonym "Strelkov" ("Strelok") can be roughly translated as "Rifleman" or "Shooter". He has also been dubbed Igor Grozny ("Igor the Terrible"). Alexander Cherkasov, head of Russia's leading human rights group Memorial, is convinced that the "Igor Strelkov" involved in Ukraine is the same person as a Russian military officer called "Strelkov", who was identified as being directly responsible for at least six instances (on four separate occasions) of the forced disappearance and presumed murder of residents of Chechnya's mountain Vedensky District village of Khatuni and nearby settlements of Makhkety and Tevzeni in 2001–2002, when "Strelkov" was attached to the 45th Detached Reconnaissance Regiment special forces unit of the Russian Airborne Troops based near Khatuni. None of these crimes were solved by official investigations. The website of Chechnya's official human rights ombudsman lists several residents of Khatuni who went missing in 2001 (Beslan Durtayev and Supyan Tashayev) as having been kidnapped from their homes and taken to the 45th DRR base by the officers known as "Colonel Proskuryn and Strelkov Igor"; another entry lists the missing person Beslan Taramov as abducted in 2001 in the village of Elistandzhi by the 45th DRR servicemen led by "Igor Strelko (nicknamed Strikal)". Cherkasov too lists Durtayev and Tashayev (but not Taramov) among the alleged victims of "Strelkov". Cherkasov and other observers suspected it was in fact the same "Strelkov" until May 2014, when Strelkov himself confirmed he has been present at Khatuni in 2001, where he fought against the "local population". According to Cherkasov, as a result of Strelkov's actions in Chechnya, two sisters of one of those "disappeared", Uvais Nagayev,[note 2] in effect turned to terrorism and died three years later: one of these sisters, Aminat Nagayeva, blew herself up in the 2004 Russian aircraft bombings over the Tula Oblast aboard a Tu-134 "Volga-Aeroexpress" airliner, killing 43; the other sister, Rosa Nagayeva, participated in the Beslan hostage crisis that same year. The emails leaked in May 2014 and allegedly authored by Strelkov contain his diaries from Bosnia and Chechnya he sent to his friends for review. One story describes an operation of capturing Chechen activists from a village of Mesker-Yurt. Asked by one of friends why he didn't publish them, Strelkov explained that "people we captured and questioned almost always disappeared without trace, without court, after we were done" and this is why these stories cannot be openly published. In an interview on 22 January 2015 Igor Girkin, one of the major "Russian self-defence" commanders in 2014 Crimean crisis, explained that the "overwhelming national support for the self-defence" as portrayed by the Russian media was fiction, and they actually had to "forcibly drive the deputies to vote [to join Russia]". Under his command, the rebels "collected" the deputies into the chambers to vote. A majority of the law enforcement, administration and army did not support the "self-defence" (one notable exception being Berkut) and only the presence of regular Russian army in Crimea "made the whole thing work". Girkin took part in commanding Russian troops in their capture of the Simferopol airport. I was in charge of the only unit of Crimean militia, the spetsnaz company which carried out combat missions. But after the combat for cartography base when 2 people died (I was that battle's commander), the company was disbanded and its members parted. According to an accomplice, Girkin arrived in Crimea describing himself as the "Kremlin's emissary," and soon after formed the 'Crimean self-defense' forces. His position was above that of self-declared Crimea prime minister Sergei Aksyonov, and his main task in March 2014 was the accelerated military training for the newly formed Crimean forces, and selecting the best among them for transfer to the invasion of the Donbas. Girkin personally negotiated and oversaw the withdrawal of Ukrainian forces from Crimea. According to Girkin, he was in charge of the Simferopol Photogrammatic Center's assault. After all, I pressed the launching trigger of war. If our squad did not cross the border, at the end all would have been finished as in Kharkiv or Odessa. Practically, the flywheel of war which lasts until now was launched by our squad. And I bear a personal responsibility for what is happening there. According to Girkin, the head of the newly instituted Russian government in Crimea Sergei Aksyonov asked him to deal with the northern provinces. On 12 April 2014, Girkin led a group of militants who seized the executive committee building, the police department, and the Security Service of Ukraine offices in Sloviansk. Girkin claimed that his militia was formed in Crimea and consisted of volunteers from Russia, Crimea, and also from other regions of Ukraine (Vinnitsa, Zhitomir, Kiev) and many people from Donetsk and the Lugansk region. According to him, two thirds were Ukrainian citizens. The majority of men in the unit had combat experience. Many of those with Ukrainian citizenship had fought in the Russian Armed Forces in Chechnya and Central Asia, others had fought in Iraq and Yugoslavia with the Ukrainian Armed Forces. In an interview, Girkin stated that he was given orders not to give up Sloviansk. The SBU presented Strelkov's presence in Donbass as proof of Russia's involvement in the East Ukraine crisis and released intercepted telephone conversations between "Strelkov" and his supposed handlers in Moscow. Russia denied any interference in Ukraine by its troops outside Crimea. In July, Ukrainian authorities alleged Russian Defense Minister Sergei Shoygu has coordinated all of Girkin's actions, supplying him and "other terrorist leaders" with "the most destructive weapons" since May and instructing him directly, with Russian President Vladimir Putin's approval. On 15 April, the Security Service of Ukraine (SBU) opened a criminal proceeding against "Igor Strelkov". He was described as a Russian recruiter and leader of armed "saboteurs" and a chief organizer of the "terror" in Ukraine's Sloviansk Raion (including an ambush that killed one and wounded three SBU officers), who had coordinated Russian military takeovers of Ukrainian units in Crimea during the 2014 Crimea crisis in March, after having crossed the Russian-Ukrainian border in Simferopol on 26 February. In Crimea, he was reported to be instrumental in negotiating the defection of the Ukrainian Navy commander Denis Berezovsky. The next day (16 April), he allegedly sought to recruit Ukrainian soldiers captured at the entrance to Kramatorsk. Ukrainian government claims Strelkov was behind the 17 April kidnapping, torture and murder of a local Ukrainian politician Volodymyr Rybak and a 19-year-old college student Yury Popravko. Rybak's abduction by a group of men in Horlivka was recorded on camera. The SBU released portions of intercepted calls in which another Russian citizen, alleged GRU officer and Girkin's subordinate Igor Bezler orders Rybak to be "neutralized", and a subsequent conversation in which "Strelkov" is heard instructing Ponomarev to dispose of Rybak's body, which is "lying here [in the basement of the separatist headquarters in Sloviansk] and beginning to smell." Rybak's corpse with a smashed head, multiple stab wounds and ripped stomach was found later in April in a river near Sloviansk; Popravko's body was also found nearby. Ukrainian Interior Minister Arsen Avakov described Girkin as "a monster and a killer" and the incident helped prompt the government's "anti-terrorist" military offensive against the pro-Russia separatists in Ukraine. I absolutely do not worry about international law, because it is a tool at the hands of victors. If we are defeated, then it means that the norms of the law will be used against me. During the weekend of 26–27 April, the political leader of the separatist Donetsk People's Republic (DPR), Girkin's long-time friend, Alexander Borodai, also a Russian national from Moscow, ceded control of all separatist fighters in the entire Donetsk region to him. On 26 April, "Strelkov" made his first public appearance when he gave a video interview to Komsomolskaya Pravda where he confirmed that his militia in Sloviansk came from Crimea. He said nothing about his own background, denied receiving weapons or ammunition from Russia, and announced that his militia would not release the Organisation for Security and Co-operation in Europe (OSCE) observers that it had taken hostage unless pro-Russia activists were first freed by the Ukrainian government. On 28 April, the EU sanctioned "Igor Strelkov" as a GRU staff member believed to be a coordinator of armed actions and a security assistant to Crimea's Sergey Aksyonov. On 29 April, Girkin appointed a new police chief for Kramatorsk. On 12 May, "I. Strelkov" declared himself "the Supreme Commander of the DPR" and all of its "military units, security, police, customs, border guards, prosecutors, and other paramilitary structures." According to a report issued by the Office of the United Nations High Commissioner for Human Rights, "reportedly, on 26 May, by order of Strelkov, Dmytro Slavov ('commander of a company of the people's militia') and Mykola Lukyanov ('commander of a platoon of the militia of Donetsk People's Republic') were 'executed' in Sloviansk, after they were 'sentenced' for 'looting, armed robbery, kidnapping and abandoning the battle field'. The order, which was circulated widely and posted in the streets in Slovyansk, referred to a decree of the Presidium of the Supreme Council of the USSR of 22 June 1941 as the basis for the execution." The report also mentions Strelkov's efforts to recruit local women into his armed formations: "A particular call for women to join the armed groups was made on 17 May through a video released with Girkin 'Strelkov', urging women of the Donetsk region to enlist in combat units." Sloviansk's separatist "people's mayor" and former boss of Girkin, Ponomarev, was himself detained on an order of "Strelkov" on 10 June for "engaging in activities incompatible with the goals and tasks of the civil administration". In an interview with "Radio-KP" on 18 January 2016, Girkin acknowledged that he used extrajudicial punishment and at least four people were executed by firing squad, while he was in Sloviansk. On the night of 4–5 July, during a large-scale offensive by the Ukrainian military following the end of a 10-day ceasefire on 30 June, Girkin and his militants fled from Sloviansk, which was then captured by Ukrainian forces, thus ending the separatist occupation of the city which had started on 6 April. Shortly before this, a video was posted on YouTube in which Girkin desperately pleaded for military aid from Russia for "Novorossiya" ("New Russia", an historical name for South-East Ukraine with particular popularity amongst separatists) and said Sloviansk "will fall earlier than the rest." Other rebel leaders denied Girkin's assessment that the people's militia were on the verge of collapse. One of them, the self-proclaimed "people's governor" of Donetsk Pavel Gubarev, compared Girkin to the 19th century Russian general Mikhail Kutuzov, claiming that both "Strelkov" and Kutuzov would "depart only before a decisive, victorious battle." However, his retreat was strongly criticized by the Russian nationalist Sergey Kurginyan and a rumor inside Russian ultranationalist circles alleged Russia's powerful "grey cardinal" figure Vladislav Surkov conspired with east Ukrainian oligarch Rinat Akhmetov to organize a campaign against "Strelkov" as well as against the Eurasianism ideologue Alexander Dugin. Kurginyan accused Strelkov of surrendering Sloviansk and not keeping his oath to die in Sloviansk. Kurginyan believes that surrendering Sloviansk is a war crime, and Strelkov should be responsible for that. Donetsk People's Republic security minister Alexander Khodakovsky, the SBU Alfa defector and commander of the rebel Vostok Battalion, also protested and threatened a mutiny. In social networks Girkin claimed that "Junta forces" drive their newly mobilized Ukrainian soldiers into the ground with bulldozers, National Guard of Ukraine shoots at peaceful citizens and own "punishers" and the "punishers" with use of artillery and MRLs succeeded in destroying the local potato harvest. On 10 July 2014, news outlet Mashable reported finding execution orders three days earlier for Slavov and Lukyanov in Girkin's abandoned Sloviansk headquarters. The orders were signed "Strelkov" with the name Girkin Igor Vsevolodovich printed underneath. Also sentenced to death was Alexei Pichko, a civilian who was caught stealing two shirts and a pair of pants from an abandoned house of his neighbour; according to an unconfirmed story, his body "had been dumped on the front lines" after he was executed. On 24 July, Ukrainian authorities exhumed several corpses from a mass grave site on the grounds of a children's hospital near the Jewish cemetery in Slovyansk, which might contain as many as 20 bodies of those executed by order of "Strelkov". Among the identified victims were four Ukrainian Protestants who the police and locals said have been kidnapped on 8 June after attending a service at their church, falsely accused of helping the Ukrainian Army, robbed for their cars, and shot the following day. Multiple sources cited a post on the VKontakte social networking service that was made by an account under Girkin's name which acknowledged shooting down an aircraft at approximately the same time that the civilian arliner Malaysia Airlines Flight 17 (MH17) was reported to have crashed in eastern Ukraine in the same area near the Russian border on 17 July 2014. The post specifically referenced how warnings were issued for planes not to fly in their airspace and the downing of a Ukrainian military Antonov An-26 transport plane which the Ukraine Crisis Media Center suggested was a case of misidentification with the MH17. This post was deleted later in the day and the account behind it claimed that Girkin has no official account on this social service. Most of the 298 victims in the plane's crash came from the Netherlands; on 19 July the country's biggest newspaper De Telegraaf included Girkin's photo in the front page collage of pro-Russian rebel leaders under the one-word headline "Murderers" ("Moordenaars"). Russian opposition lawyer and politician Mark Feygin posted a purported order by Girkin where he instructs all his men and commanders who "have in their possession personal effects from this plane" to deliver the found items to his HQ so "the valuables (watches, earrings, pendants, and other jewelry and items from valuable metals)" would be transferred to "the Defense Fund of the DPR." Girkin was reported to be the author of an alternative version of the incident, wherein "no living people were aboard the plane as it flew on autopilot from Amsterdam, where it had been pre-loaded with 'rotting corpses'." This conspiracy theory was then distributed and discussed in Russian state-controlled media outlets. At his press-conference on 28 July 2014, Girkin denied his connection to the downed plane and announced that his militants were killing "black-skinned" mercenaries. According to ITAR-TASS news agency on Wednesday, 13 August 2014, Girkin was seriously wounded the previous day in fierce fighting in the pro-Russian rebel held territories of Eastern Ukraine, and was described to be in "grave" condition. DNS representative Sergei Kavtaradze refuted this news this shortly after, saying Strelkov is "alive and well". On 14 August the leadership of the DNR announced that Strelkov was dismissed from his position of defense minister "on his own request" as he was assigned "some other tasks". On 16 August the Russian TV-Zvezda claimed that Strelkov was "on vacation" and was appointed as a military chief of combined forces of Lugansk and Donetsk (he had been in command of Donetsk forces only) and after he returns he will be put to a task of creating an unified command over forces of Federal State of Novorossiya. According to Stanislav Belkovskiy, the main reason for removal of Girkin from the "defense minister" position was the amount of attention caused by downing the MH17 and negative impact on Russia's actions in Ukraine that it caused. On 22 August a former rebel Anton Raevsky ("Nemetz") said in an interview in Rostov-on-Don that Strelkov and his supporters are being cleansed from DNR by FSB because of this insufficient compliance with Kremlin's policy on the republic. 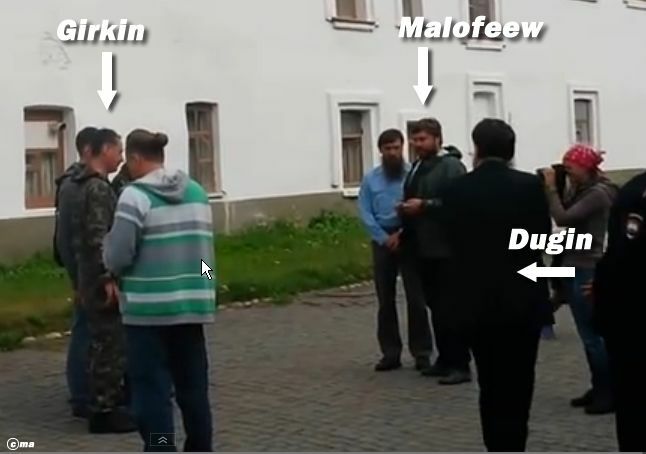 On 28 August Russian media published photos of Girkin walking with Alexander Dugin and Konstantin Malofeev in Valaam Monastery in northern Russia. In November 2014 in an interview for "Moscow Speaking" radio said that "the existence of Lugansk and Donetsk People's Republics in their current form, with the low-profile but still bloody war, is definitely convenient for USA in the first place, and only for them, because they are the ulcer that divides Russia and Ukraine". Later in November in an interview for "Zavtra" newspaper Girkin stated that the war in Donbass was launched by his detachment despite both Ukrainian government and local combatants avoided an armed confrontation before. Also he recognized himself responsible for actual situation in Donetsk and other cities of the region. According to the Nemtsov Report Girkin acknowledged that he resigned from his official position in the DNR due to pressure from the Kremlin. He also stated that Vladislav Surkov plays a decisive role in Donbass. In late April 2014, Strelkov was identified by Ukrainian intelligence as Colonel Igor Girkin, registered as a resident of Moscow. Journalists visiting the apartment where he allegedly lived with his mother, sister, as well as his former wife and two sons, were told by neighbors that a "fancy black car" had that same morning picked up the woman living there. The neighbors also described him as "polite" and quiet, and knew him under two surnames, Girkin and Strelkov. Girkin is known as a fan of military-historical movement and has participated in several reenactments connected with various periods of Russian and international history, but especially the Russian Civil War where he would play a White movement officer. His personal idol and role model is said to be the White Guard general Mikhail Drozdovsky, killed in a battle with the Red Army in 1919. According to The New York Times, "his ideological rigidity precedes any connections he has to Russia's security services, stretching back at least to his days at the Moscow State Institute for History and Archives. There, Mr. Strelkov obsessed over military history and joined a small but vocal group of students who advocated a return to monarchism." Vice News claimed that "during the 1990s, Girkin wrote for the right-wing Russian newspaper Zavtra, which is run by the anti-Semitic Russian nationalist Alexander Prokhanov" and where Borodai was an editor. Writing for Zavtra ("Tomorrow"), Girkin and Borodai, who too was reported to have fought for Russia-backed Transnistria and Republika Srpska separatists in Moldova and Bosnia and Herzegovina, together covered the Russian war against separatists in Chechnya and Dagestan. He would also often write as a "Colonel in the Reserves" on Middle East subjects, such as the conflicts in Libya, Egypt and Syria, and for the Abkhazian Network News Agency (ANNA), a Russian-language pro-Russian publication which supports Abkhazian separatism in Georgia. Strelkov claims that he worked as a security chief for the controversial Russian businessmen Konstantin Malofeev. The Prime Minister of the self-proclaimed Donetsk Republic Alexander Borodai was also a close associate of the businessman. Andrey Piontkovsky adduces the name of Girkin among the names of like-minded persons and says, "The authentic high-principled Hitlerites, true Aryans Dugin, Prokhanov, Prosvirin, Kholmogorov, Girkin, Prilepin are a marginalized minority in Russia." Piontkovsky adds, "Putin has stolen the ideology of the Russian Reich from the domestic Hitlerites, he has preventively burned them down, using their help to do so, hundreds of their most active supporters in the furnace of the Ukrainian Vendée." In his interview with Radio Liberty, Piontkovsky says, maybe the meaning of the operation conducted by Putin is to reveal all these potential passionate leaders of social revolt, send them to Ukraine and burn them in the furnace of the Ukrainian Vendée. In his interview with Oleksandr Chalenko on 2 December 2014, Girkin confirmed that he is an FSB colonel. He also acknowledged that anarchy exists among the so-called Novorossiya militants. He stated that Igor Bezler's militants in particular acted independently, the so-called "Russian Orthodox Army" had split in half, and others forces represented a patched cover of various unrelated groups. Girkin criticised the ongoing attacks on the Donetsk International Airport as pointless and harmful. After Lugansk commander Alexander "Batman" Bednov was killed by other militants in January 2015, Girkin criticised the killing as a "murder" and "gangster ambush", and suggested that other commanders seriously consider leaving Donbass to Russia, as he did. In a January 2015 interview for Anna News, Girkin said that in his opinion "Russia is currently at state of war", since the volunteers who arrive to Donbass "are being supplied with arms and shells". He also noted that "he never separated Ukraine from Soviet Union in his mind" so he considers the conflict as a "civil war in Russia". In October 2015, Girkin said that he planned to create a party that would oppose Putin's government and "respond to the Western fascist threat that Russia faces today." In March 2016 Girkin's appearance as panelist on Moscow Economic Forum along with Oleg Tsarev and Pavel Gubarev attracted critical reactions in Russia, with Yaroslav Grekov from Ekho Moskvy accusing MEF organizers of "promoting terrorism". In May 2016, Girkin announced the creation of the Russian National Movement [ru], a neo-imperialist political party. The party is in favor of "uniting the Russian Federation, Ukraine, Belarus, and other Russian lands into a single all-Russian state and transforming the entire territory of the former USSR into an unconditional zone of Russian influence." Girkin said "the Russian National Movement fully rejects President Vladimir Putin's regime and calls for an end to the current climate of fear and intimidation of Russia's citizens". The party has called for "strict quota system for migrant workers from the former Soviet republics in Central Asia and the Caucasus" and the cancelling of laws on internet control. ^ The pro-Russian group Heroes of South-East (Герои Новороссии) published Strelkov's past military assignments, disclosed by himself on military reconstructions forum: June 1993 – July 1994 military unit (в/ч) 11281 МО ПВО; Feb–Dec 1995 contract service 22033 «Х» (166-я гв. МСБР); 24 March 1995 till 10 October 1995 67th ОГСАД; August 1996 – July 2000 military unit 31763. July 2000 – April 2005 military unit 78576. After 2005 military unit 36391. The latter was identified as international terrorism prevention unit of FSB (Управление по борьбе с международным терроризмом 2-й Службы ФСБ России). ^ Uvais Nagayev was a resident of Tevzani who was originally detained by the troops of the 45th DRR on 27 April 2001. After surviving a summary execution that killed Zaur Dagayev (Nagayev was wounded and pretended to be dead), Nagayev was again detained by a group of federal servicemen including Strelkov and then held for ransom before being transported to Khankala military base and vanishing without a trace. According to an FSB-connected mediator, Nagayev had been tortured into confessing to unspecified crimes before he was executed and his body was destroyed with explosives. ^ a b c d e f g "Portraits of century: Igor Strelkov". ^ Стрєлков, який насправді має інше ім'я, наказував викрасти інспекторів ОБСЄ [Strelkov, who actually has a different name, ordered to kidnap OSCE inspectors]. Українська правда (in Ukrainian). 28 April 2014. Retrieved 16 June 2014. ^ a b c d Leonard, Peter (29 April 2014). "Meet Igor Strelkov, The Face of the Insurgency in Eastern Ukraine". The World Post. Slovyansk. Associated Press. Retrieved 1 May 2014. ^ a b c Sonne, Paul; Shishkin, Philip (26 April 2014). "Pro-Russian Commander in Eastern Ukraine Sheds Light on Origin of Militants". The Wall Street Journal. Retrieved 1 May 2014. ^ Самопроголошеному міністру оборони "ДНР" І. Стрєлкову інкримінується створення терористичної організації та вчинення терактів в Україні [Strelkova, the self-proclaimed minister of defence of the DNR terrorist organization, charged with creating and committing acts of terrorism in Ukraine]. Prosecutor General's Office of Ukraine (in Ukrainian). 21 May 2014. Retrieved 16 June 2014. ^ a b c Dahlburg, John-Thor (28 April 2014). "EU Names 15 New Targets for Sanctions". ABC. Brussels. AP. Retrieved 29 April 2014. ^ a b c Главарем диверсантів на Сході України виявився спецназівець із Росії – СБУ [Leader of saboteurs in eastern Ukraine was Spetsnaz agent from Russia - SBU] (in Ukrainian). ТСН. 15 April 2014. Retrieved 19 April 2014. ^ a b Klochko, Taras (27 April 2014). Чому Москва засвітила "Стрілка" [Why Moscow revealed "Arrow"]. espreso.tv (in Ukrainian). Retrieved 1 May 2014. ^ Donald N. Jensen (1 October 2014). "Are the Kremlin Hardliners Winning?". Institute of Modern Russia. ^ Пресс-конференция Стрелкова с точки зрения кровавого режима (in Russian). Sputnikipogrom.com. 12 September 2014. ^ В бой за Донбасс идет господин реконструктор! [In the battle for the Donbass is Mr. Enactor!]. Комсомольская Правда (in Russian). 29 April 2014. Retrieved 16 June 2014. ^ a b "The New York Times". nytimes.com. Retrieved 14 September 2014. ^ Mezzofiore, Gianluca (25 July 2014). "Igor Strelkov: Key MH17 Crash Suspect Linked to Massacre of 3,000 Bosnian Muslims in 1992". International Business Times. Retrieved 25 July 2014. ^ Сааков, Рафаэль (30 April 2014). Донецкий сепаратист Пушилин: нас объединяет русский мир [Donetsk separatist Pushilin: Russian world unites us]. BBC News (in Russian). Russia. Retrieved 16 June 2014. ^ "Ukraine crisis: Key players in eastern unrest". BBC News. 20 May 2014. Retrieved 16 June 2014. ^ "Полный архив почты Стрелкова-Гиркина (для самых любознательных)". Shaltai Boltai. 2014-05-18. Retrieved 2014-10-12. ^ a b "кто такой Стрелков-Гиркин по данным хакеров Анонимного Интернационала". 2014-10-05. Retrieved 2014-10-12. ^ Nechepurenko, Ivan (15 May 2014). "Santa-for-Hire, Soapmaker Run Insurgency in Ukraine's East". The Moscow Times. Retrieved 16 June 2014. ^ Shynkarenko, Oleg (22 May 2014). "The Kremlin's Crazy Shock Troops". The Daily Beast. Retrieved 23 June 2014. ^ a b c d e f Salem, Harriet (1 July 2014). "Who's Who in the Donetsk People's Republic". VICE News. VICE. Retrieved 5 July 2014. ^ Higgins, Ean (19 July 2014). "Igor Strelkov named as culprit in MH17 disaster". The Australian. Sydney. Retrieved 27 July 2014. (Subscription required (help)). ^ a b ""Чеченизация" Украины: для чего это сделано | АРГУМЕНТ". Argumentua. 3 June 2014. Retrieved 16 June 2014. ^ a b c "Радио ЭХО Москвы :: 'Игорь Стрелков' в Чечне. 2001 год, Веденский р-н / Комментарии". Echo of Moscow. 17 October 2011. Retrieved 16 June 2014. ^ a b c "Ежедневный Журнал: Эхо прошедшей войны". Ежедневный журнал. 24 September 2012. Retrieved 16 June 2014. ^ "Список людей на букву Д". Chechenombudsman.ru. Retrieved 16 June 2014. ^ "Список людей на букву Т". Chechenombudsman.ru. Retrieved 16 June 2014. ^ "Пропавшие". Chechenombudsman.ru. Retrieved 16 June 2014. ^ "Игорь Стрелков, информация за день: противник понес потери и отступил". Русская весна. 16 May 2014. Retrieved 16 June 2014. ^ a b "Sisters in arms | World news". The Guardian. Retrieved 23 June 2014. ^ "Chechen sisters blamed for two suicide attacks". The Sydney Morning Herald. Retrieved 23 June 2014. ^ "И.Стрелков vs Н.Стариков "ЦЕНТРСИЛЫ / СИЛАЦЕНТРА"" [I. Strelkov vs N. Starikov debate]. Neuromir TV. 2015-01-22. Retrieved 2015-01-25. ^ Games with lives. Revelations of Girkin. OmTv at youtube. ^ a b c «Кто ты, «Стрелок»?» (in Russian). zavtra.ru. 2014-11-20. ^ a b c Командующий самообороной Славянска Игорь Стрелков: Задержанные наблюдатели — кадровые разведчики. Комсомольская правда (in Russian). 26 April 2014. Retrieved 26 August 2014. ^ a b Kim, Lucian. "Should Putin fear the man who 'pulled the trigger of war' in Ukraine?". Reuters Blogs. Retrieved 2016-02-27. ^ Rosenberg, Steven (30 April 2014). "Ukraine crisis: Meeting the little green men". BBC News. Donetsk: BBC. Retrieved 1 May 2014. ^ "''Стрілок'' зі Слов'янська показав обличчя та розповів про своїх ''ополченців''". Українська правда. 26 April 2014. Retrieved 16 June 2014. ^ "СБУ: агент Стрелков - доказательство диверсий России - BBC Ukrainian - Новини російською". BBC. 16 April 2014. Retrieved 16 June 2014. ^ "Intercepted Phone Calls Show Putin Called The Shots on European Hostages in Ukraine". Forbes. Retrieved 16 June 2014. ^ Anna Nemtsova. "Putin's Number One Gunman in Ukraine Warns Him of Possible Defeat". The Daily Beast. Retrieved 25 July 2014. ^ "Head of Slovyansk saboteurs is Russian special forces officer called Gunman - SBU". UNIAN (in Ukrainian). UNIAN. 15 April 2014. Retrieved 29 April 2014. ^ Greenhill, Sam (2014-07-17). "'That was a blast - look at the smoke': Sick boast of the laughing rebels as they 'saw MH17 hit by missile' - hours after leader boasted: 'We warned you - do not fly in our sky' | Mail Online". Dailymail.co.uk. Retrieved 22 July 2014. ^ a b c Kashin, Oleg (2014-07-19). "Igor Strelkov: Russian War Reenactor Fights Real War in Ukraine". New Republic. Retrieved 24 July 2014. ^ "Russian GRU colonel Gunman tried to recruit captured Ukrainian VDV troops in Slovyansk - Soldier's testimony". Interfax Ukraine (in Ukrainian). Interfax Ukraine. 18 April 2014. Retrieved 29 April 2014. ^ a b Harding, Luke (26 April 2014). "Ukrainian separatist leader defends capture of 'Nato spies'". The Guardian. Slavyansk. Retrieved 29 April 2014. ^ a b c "'Murdered' Ukraine politician faced hostile mob, video shows". Reuters. 23 April 2014. Retrieved 17 June 2014. ^ Paul Roderick Gregory (1 May 2014). "Putin's Ukrainian executioners worse than Stalin's". KyivPost. Retrieved 17 June 2014. ^ a b "'In Cold Blood' in Ukraine". The Daily Beast. 3 May 2014. Retrieved 17 June 2014. ^ a b "Стрелков: Расстрелы в Славянске проводились по "сталинским законам"" [Strelkov: We conducted shootings in Slovyansk according to "Stalin's laws"] (in Russian). Ukrayinska Pravda. 18 January 2016. ^ a b "Russian citizen Girkin (Strelkov) appoints Kramatorsk police chief". Interfax Ukraine (in Ukrainian). 29 April 2014. Retrieved 29 April 2014. ^ Новости Донбасса :: ДНР объявила войну Украине и призвала на помощь Россию (in Ukrainian). Novosti.dn.ua. 2014-03-09. Retrieved 29 July 2014. ^ Диверсант ''Стрілок'' після перевороту оголосив війну Києву й просить допомоги в Кремля | Українська правда (in Ukrainian). Pravda.com.ua. 2014-05-13. Retrieved 29 July 2014. ^ Office of the United Nations High Commissioner for Human Rights (15 June 2014). "Report on the human rights situation in Ukraine" (PDF). Retrieved 14 September 2014. ^ Shamanska, Anna (19 January 2016). "Former Commander Of Pro-Russian Separatists Says He Executed People Based On Stalin-Era Laws". Radio Free Europe. ^ AFP (20 April 2011). "Pro-Russia rebels and commander flee Slavyansk". Yahoo News. Retrieved 5 July 2014. ^ a b Demirjian, Karoun. "Rebels flee Slovyansk as Ukrainian forces recapture key city". The Washington Post. Retrieved 5 July 2014. ^ Tsvetkova, Maria. "Ukraine government forces recapture separatist stronghold". Reuters. Retrieved 5 July 2014. ^ a b Rothkopf, David. "All Is Not Well in Novorossiya". Foreignpolicy.com. Retrieved 25 July 2014. ^ a b Кургинян: Стрелков не выполнил своей клятвы умереть в Славянске (in Russian). Rosbalt.ru. 7 July 2014. ^ Christopher Mille (2014-07-10). "Soot-Stained Documents Reveal Firing Squad Executions in Ukraine". Mashable.com. Retrieved 22 July 2014. ^ Ayres, Sabra. "Mass grave uncovered in eastern Ukraine | Al Jazeera America". America.aljazeera.com. Retrieved 25 July 2014. ^ Chazan, Guy (2014-07-04). "Slavyansk's grave reveals Ukraine's wounds". FT.com. Retrieved 25 July 2014. ^ Simon Ostrovsky. "Russian Roulette (Dispatch 63) | VICE News". News.vice.com. Retrieved 1 August 2014. ^ Miller, Christopher. "Pro-Russian Rebel Commander: 'We Did Warn You — Do Not Fly in Our Sky'". ^ a b Sterbenz, Christina (17 July 2014). "Pro-Russian Rebel Leader: 'We Have Warned Them — Not To Fly In "Our Sky"'". Business Insider. ^ Zverev, Anton (17 July 2014). "Malaysian airliner downed in Ukraine war zone, 295 dead". Reuters. ^ a b "Ukraine Separatist Social Media Site Claims Plane Downing". RFE/RL. 18 July 2014. ^ "Katastrofa malezyjskiego samolotu na granicy rosyjsko-ukraińskiej. Prawie 300 ofiar. Prezydent Ukrainy: Mógł zostać zestrzelony". Gazeta.pl. 17 July 2014. Retrieved 17 July 2014. ^ "Web evidence points to pro-Russia rebels in downing of MH17 (+video)". CSMonitor.com. 2014-07-17. Retrieved 1 August 2014. ^ Yuhas, Alan (17 July 2014). "Malaysia Airlines plane MH17 crashes in Ukraine - live updates". The Guardian. Retrieved 17 July 2014. ^ Adam Withnall (21 July 2014). "Malaysia Airlines MH17 crash: Dutch newspapers respond with anger and despair as wait for return of bodies continues - Europe - World". The Independent. Retrieved 22 July 2014. ^ "Compromising Order by Girkin-Strelkov | Voices of Ukraine". Maidantranslations.com. Retrieved 29 July 2014. ^ Kolirin, Lianne. "A pro-Russian rebel leader appeared to admit that troops have been looting bodies | World | News | Daily Express". Express.co.uk. Retrieved 29 July 2014. ^ Andrei Malgin. "Putin's Media Lives in an Alternate Reality | Opinion". The Moscow Times. Retrieved 1 August 2014. ^ "Donetsk militia commander Strelkov badly wounded — agency". ITAR-TASS. 2014-08-13. Retrieved 24 August 2014. ^ "Donetsk republic official denies defence chief Strelkov badly wounded". ITAR-TASS. 2014-08-13. Retrieved 24 August 2014. ^ "Donetsk People's Republic dismisses defense minister". ITAR-TASS. 2014-08-14. Retrieved 24 August 2014. ^ "После отпуска Стрелков займется армией Новороссии - Телеканал "Звезда"". tvzvezda.ru. Retrieved 14 September 2014. ^ "Белковский о том, зачем Кадыров закрыл инстаграм, по чему соскучился Янукович". tvrain.ru. Retrieved 2015-06-25. ^ "Гиркин "засветился" на российском острове Валаам - Политика - TCH.ua". Pro-Sport.ru. 2014-09-04. Retrieved 4 September 2014. ^ "Стрелков уверен, что США заинтересованы в существовании ДНР и ЛНР" [Strelkov believes that USA is interested in existence of LNR and DNR]. Govorit Moskva. 2014-11-06. Retrieved 2014-11-06. ^ "Слов'янськими терористами керує історичний реконструктор. ФОТО". Історична правда. Retrieved 16 June 2014. ^ a b c "Igor Strelkov – Moscow agent or military romantic?". openDemocracy. 2014-06-13. Retrieved 25 July 2014. ^ "Live Fire for Russian Historical Reenactor Spy · Global Voices". Globalvoices.org. 2014-05-04. Retrieved 25 July 2014. ^ a b Buckley, Neil (2014-07-04). "Rebel trio may have slipped Moscow's bonds". FT.com. Retrieved 22 July 2014. ^ Kashin, Oleg (19 May 2014). "Из Крыма в Донбасс: приключения Игоря Стрелкова и Александра Бородая". Slon. ^ "Александр Бородай: "Просто я, Леонтьев и Стрелков давно знакомы"". RBC daily. 26 May 2014. ^ a b Андрей Пионтковский (27 October 2014). На "Русском мире" держится пожизненная власть Путина (in Russian). Podrobnosti.ua. ^ a b Андрей Пионтковский (26 October 2014). Военная доктрина "Русского Мира" (in Russian). Kasparov.ru. ^ Михаил Соколов (9 July 2014). Крах проекта "Новороссия"? (in Russian). Radio Liberty. ^ Игорь Стрелков призвал сепаратистов последовать его примеру [Igor Strelkov called separatists to follow his example] (in Russian). TV Rain. 2015-01-03. Retrieved 2015-01-04. ^ "Диалог поколений: полковник Стрелков и генерал Тендетник" [Dialogue of the generations: colonel Strelkov and general Tendetnik]. Anna News. 2015-01-06. Retrieved 2015-01-09. ^ a b Waller, Nicholas. "Ex-Separatist Leader Launches Party Aimed at Restoring Russia's Empire". Georgia Today. Archived from the original on 2 June 2016. Retrieved 2016-06-04. ^ Греков, Ярослав. "Блоги / Ярослав Греков: Московской экономический форум предоставил трибуну военному преступнику/террористу". Эхо Москвы. Retrieved 2016-03-28. This page was last edited on 5 March 2019, at 17:30 (UTC).